Sometimes a common term does a disservice to the act it is used to describe. Such is the case with the classic sales and marketing ploy known as “cold-calling”. Cold-calling is a fishing expedition. It’s dialing someone’s number, or sending an e-mail, without being asked to do so in an attempt to sell a good or service. It is a difficult way to make a living, even as it has mostly switched from actual phone calls to electronic communication. But, for some financial advisors, it works. Approximately 50 percent of investor-advisor relationships begin with a referral from a friend or family member of the investor. Research by Spectrem Group shows that such referrals most often come from business associates or a personal friend more so than from a parent, but the fact is that those relationships begin because the investor knows someone who knows the advisor. 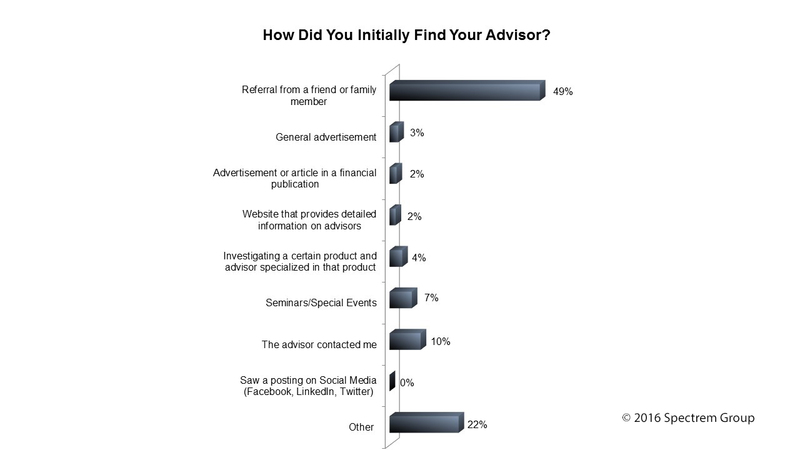 But The Spectrem research study Advisor Relationships and Changing Advice Requirements shows that at least 10 percent of all investors initially located the advisor with whom they presently work because the advisor made first contact. Have you found 10 percent of your clients via cold call, or some other first contact initiated by you? According to the research, cold-calling is the second-most frequent manner advisors find new clients, behind referrals from family and friends. Among Ultra High Net Worth investors with a net worth between $5 million and $25 million, cold-calling (11 percent) topped seminars (6 percent), general advertisements (3 percent), advertisements in financial publications (3 percent) and websites that provide detailed information on advisors (2 percent). There are numerous websites offering the secrets to cold-calling practices for financial advisors, but they all aim toward the same message: Find a target audience (corporate executives or business owners, for instance), provide the information that can help an investor investigate you during the call (like a website address or Facebook page name) and then get out. The difficulty in cold-calling is appealing to the desires of investors in the very short time you have to grab attention on a phone call or in an e-mail. Spectrem research shows that investors value honesty and trustworthiness, responsiveness to requests, and performance of investments against the stock market average in their advisors, and none of those attributes can be demonstrated in a cold call. But it behooves financial advisors making cold calls to understand why investors switch advisors, and perhaps play to those tendencies. According to the Spectrem study Why Investors Switch Advisors, the top reason investors switch advisors is because the advisor was not being proactive in contacting the investor (24 percent of investors who had switched advisors). Similar percentages switched because the advisor did not provide good advice or because of under-performance against stock market averages. However, 16 percent switched because of high fees and commissions, and 12 percent did so because advisors did not return phone calls in a timely fashion. Reaching an investor by phone to introduce yourself, and knowing a little bit about that investor from a basic information search, might be an indication to the investor that you are not afraid to pick up the phone to maintain contact as well as establish it in the first place. Cold-calling works. It obviously does not work every time, but many investors say they started their relationship with an advisor through a cold call. If you are reluctant to make a cold call but consider it a good idea, you must convince yourself of its value and prepare to put your best foot forward if the call (or email) is answered. You have something of value to sell (your services, and your firm’s resources), so be ready to sell it. Be prepared for an initial rejection and offer a second chance. The person you are calling may be too busy at the moment to consider your offer, but you can certainly suggest they give you a call back if they reconsider, or you can request a better time to call when the investor will be less busy. Don’t give up immediately. There is an art to cold-calling, and there is an art to cold emailing. Take a minute to read the many articles written about how to get your emails noticed, and how to avoid immediate rejection on cold calling. Be prepared for a positive response. Have a follow-up plan for the next meeting or phone call ready to go just in case the call works. If possible, send some type of content to an investor prior to cold-calling that demonstrates your expertise. Perhaps a blog or article that highlights your solutions to common financial planning and investment issues. This may prevent someone from immediately hanging up or deleting your email.